The back corner of the restaurant boasts a TV that constantly plays K-pop music videos. All the videos are ridiculously on trend and high budget in terms of fashion, make-up and style and once you start watching (I’m warning you), you might not be able to stop. The advent of K-pop is bringing back all-boy and all-girl bands like it ain’t no thang. The music is just loud enough that you notice it and can bob your head to the beat while still remaining totally present in your conversation over dinner. 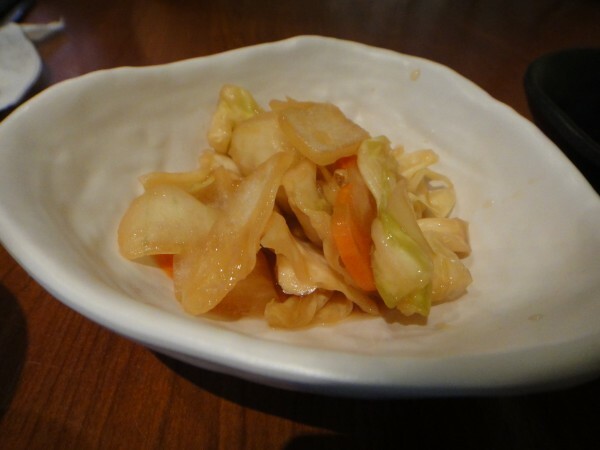 The banchan served here are kimchi and marinated cabbage and carrots. 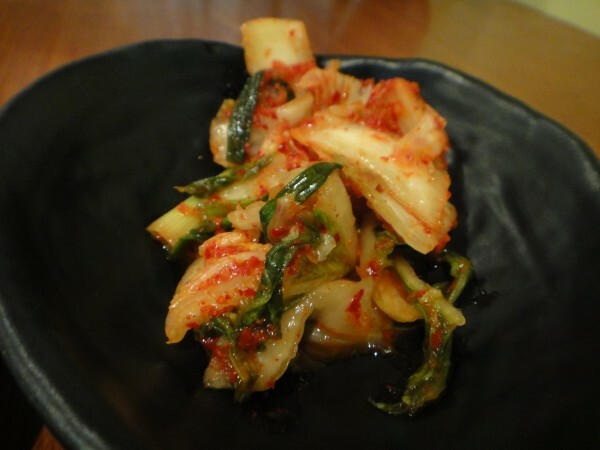 The kimchi we had both times we went was just a touch too salty, so we let that one sit. The marinated veggies though were perfect and crunchy and the vinegary taste was spot on. A nice snack before the meal for sure. Note that refills are free! 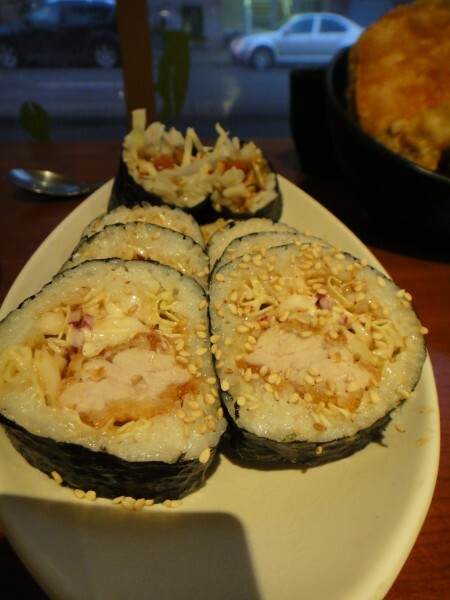 The kimbap here is particularly good – I would strongly suggest getting one to try. We had the kimbap chamchi and kimbap tonkatsu to share. 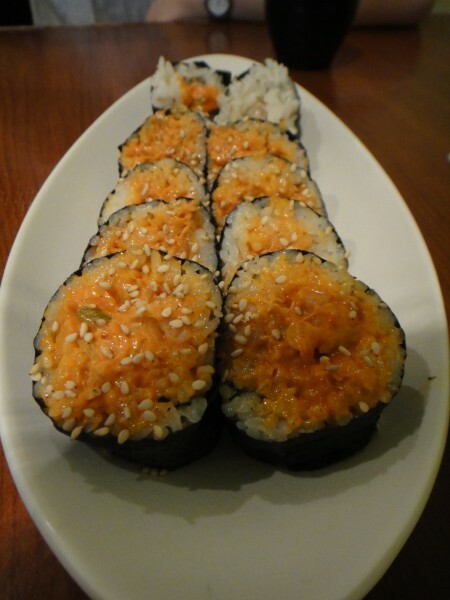 The chamchi had spicy cooked tuna nestled at the center of a rice roll; slathered with a creamy sauce, the tuna was portioned so that each bite had a great balance of fish to rice with just a hint of spiciness. Pretty delicious. The tonkatsu was made with fried pork cutlet, rolled with a bit of cabbage and sprinkled with some sesame seeds. This one was a bit more filling but taste-wise a little less exciting. Still very good though. Everyone who had told us about the restaurant suggested we try the dak balls. A generous amount of fried chicken beckoned – steam wafted up and hit us in the face, forcing us to abandon eating other things for the time being. 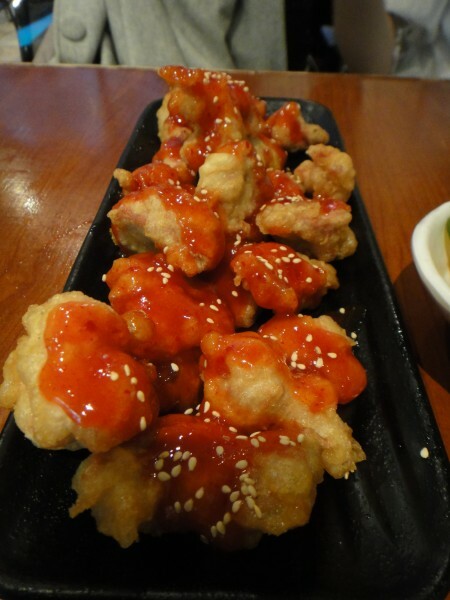 Golden, crispy, battered fried chicken with a red sweet and spicy sauce (GaNaDaRa house special) waved hello. The chicken was tender and juicy on the inside, crispy on the outside. What else could you ask for from comfort food like this? The tuikim family is a combination of deep fried seafood and veggies – depending on what’s available in the kitchen, every ‘family’ varies. 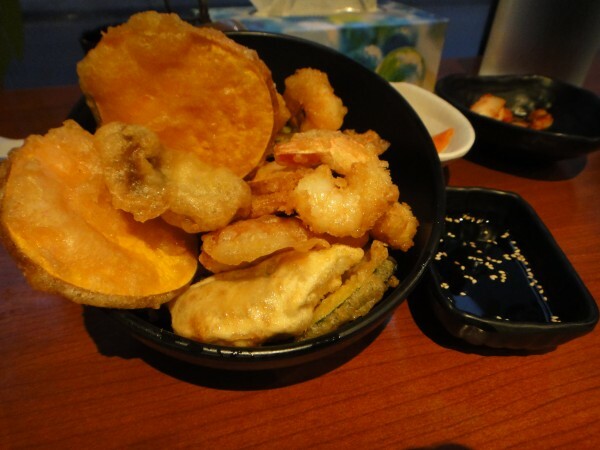 We had a mix of tempura’d mushrooms, sweet potatoes, zucchini, onions and shrimps. For me, this dish didn’t cut it. The attempt to recreate the tempura effect did not work here in that the items served were soft and oily and not crispy at all. By the time we got to the bottom of the bowl, there was a pool of grease and oil sitting at the bottom. The ramyeon here has been hyped so much that I had to give it a shot. Previous to going, I knew that the noodles served here come out of a pack, explaining the cheap prices. The noodles are served in the same pot they’re cooked in, lending a sort of college vibe to the dish (think the Asian version of cooking Kraft dinner on a portable electric oven then eating from the pot). I didn’t have it in me to go through with the one with sliced Kraft cheese on top… Instead, I got the spicy ramyeon with green chili peppers added. This one is no joke. My. Mouth. Was. On. Fire. It is really, really spicy. Proceed with caution. The jarachi guksu is huge bowl of thin noodles in a light, mild crab broth. This one is pretty much the complete opposite to the spicy ramyeon. It’s gentler and much more refined. 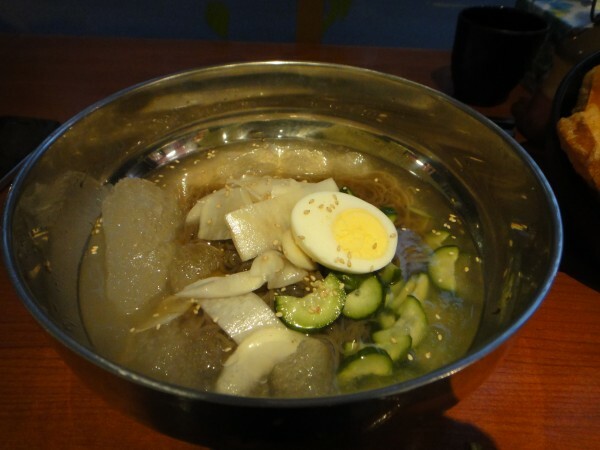 The stereotypical Korean noodle dish eaten to cool off from the summer heat is the naengmyeon bowl. Served in the usual metal bowl and vinegary soup flanked by large chunks of ice, the noodles are made out of buckwheat. They’re stretchy and full of elasticity, proving hard to cut even when biting down (hard) with your teeth. The vinegar is already added for you so you’re sure to taste that signature flavour. The whole experience is pretty fun actually. The cold noodles are topped with half a boiled egg and some marinated cucumbers and daikon. Note that these cold noodle dishes are only available in the summer. 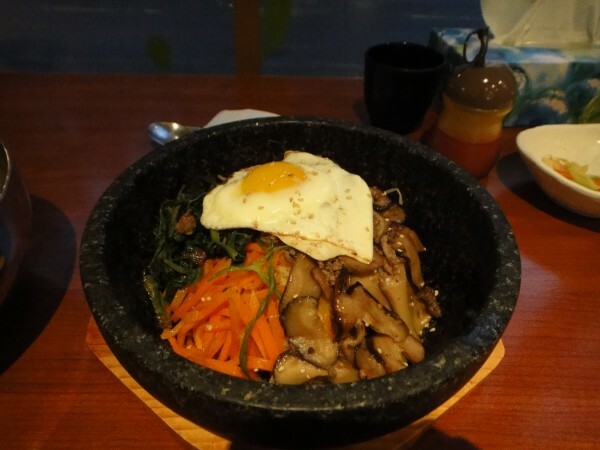 The bibimbap is served in a hot stone bowl, with rice as the base and select toppings of mushrooms, sliced carrots, bean sprouts, a bit of bulgogi and a fried egg on top. A good standard to order if you want something basic and very typically Korean. The portions at GaNaDaRa are not only generous but also very budget friendly. Located next to major student populations (Concordia, Dawson, McGill etc. 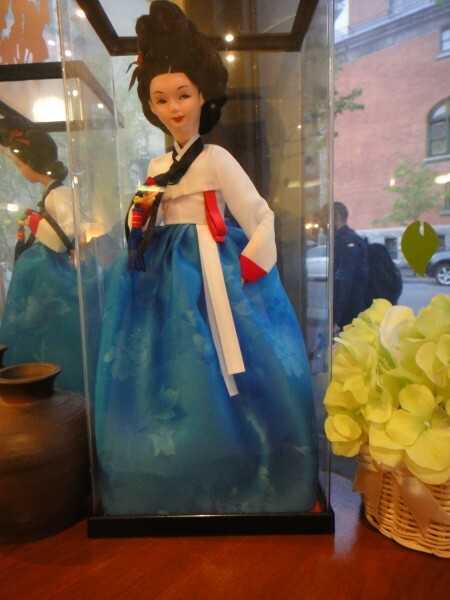 ), it’s no surprise that the restaurant almost always full. 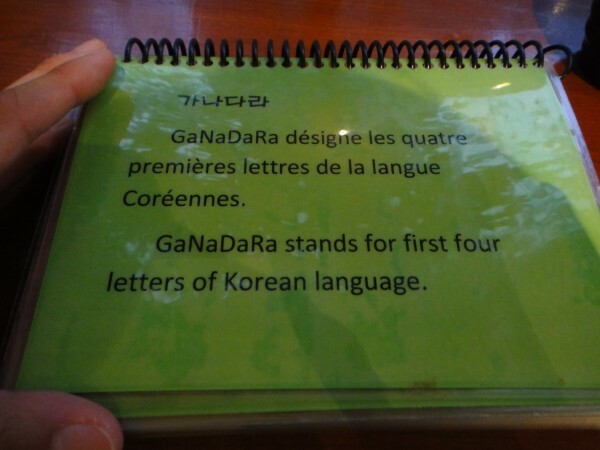 GaNaDaRa serves Korean food two ways: traditional comfort food and something that might qualify as being a part of a new wave of culture food mash-ups (i.e. tteokbokki poutine, ramyeon with Kraft slices etc.). In terms of Korean food in Montreal, this one has definitely got a place among my favourites. 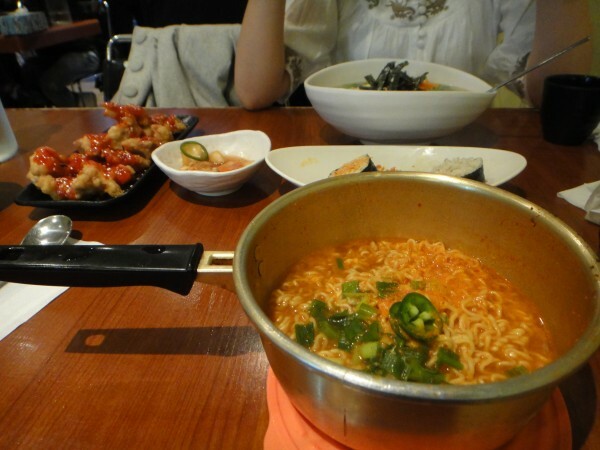 Tags: Bibimbap, Dinner, GaNaDaRa, Kimbap, Kimchi, Korean, Lunch, Maisonneuve, Montreal, Noodles, Ramen, Ramyeon, Spicy. Yeah definitely! I’m heading to Europe in a week tho. It would be great to meet up again.